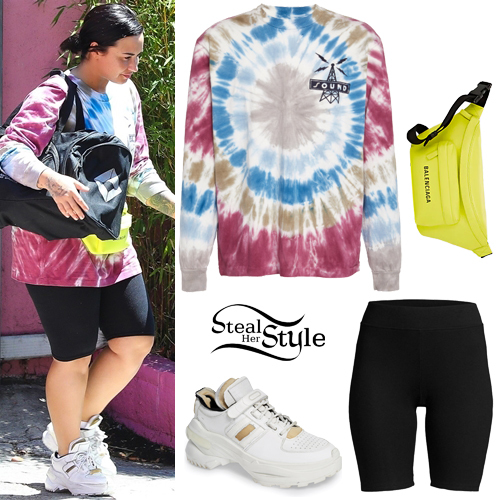 Demi Lovato was spotted leaving the gym in Los Angeles wearing a Just Don Record Low Tie Dye Sweatshirt ($350.00), ATM Anthony Thomas Melillo Micromodal Ribbed Bike Shorts ($175.00), a Balenciaga Everyday Leather Belt Bag ($1,250.00), a duffel bag from her gym Wasatch Combat Sports (Not available online) and Maison Margiela Retro Fit Destroyed Sneaker ($895.00). 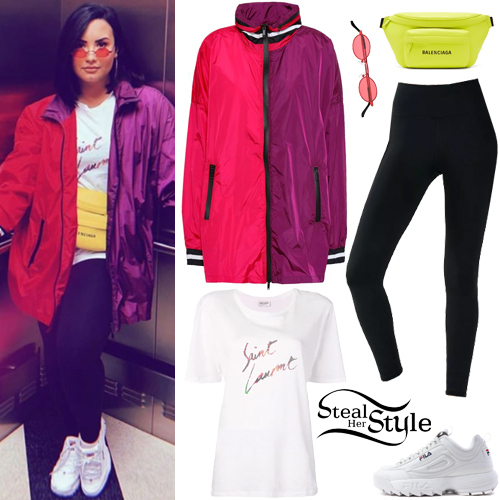 Demi Lovato posted a picture on instagram a couple of days ago wearing a Sapopa Kaylin Colorblocked Jacket ($365.00), Saint Laurent 80s Style Logo T-Shirt ($450.00), Fabletics High-Waisted Solid PowerHold Legging ($69.95), a Balenciaga Logo Belt Bag ($600.00 – wrong color), Roberi & Fraud Doris Sunglasses ($195.00) and Fila Disruptor II Sneakers ($65.00). 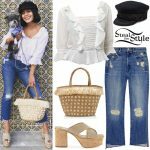 Cierra Ramirez posed at the Coachella Music Festival – Day 3 wearing the h:ours Danika Mini Dress ($168.00) with Balenciaga Triple S Sneakers ($895.00). Kendall Jenner attended the Tiffany & Co. Store Opening in Sydney wearing an Ingie Paris Spring 2019 RTW Dress (Not available online), a Tiffany & Co. Diamond Butterfly Collar (Not available online) and Balenciaga Square Knife Pumps ($950.00). Hailey Baldwin was spotted out and about in Beverly Hills wearing Acne Studio Jana Linen Blazer ($745.00), Maison Margiela Cut-Out Detail Jeans (Sold Out), an Explorer Pouch Strap Bag ($695.00) and Knife Pumps ($950.00) both by Balenciaga. Iggy Azalea was spotted departing LAX wearing a Denim Jacket similar to this one from VII&CO. (Sold Out), Undercover Astro Badge Fleece Jogging Bottoms ($590.00), a vintage Fendi Mesh Tote Bag ($309.00 – preowned, wrong print), a Balenciaga Embroidered Cotton-Twill Baseball Cap ($450.00) and Dior D-Connect Kaleidiorscopic Sneakers ($1,150.00). Hailey Baldwin was spotted leaving Hot Pilares in Los Angeles wearing the Peak Bra ($54.00) and High Waist Moto Leggings ($114.00) both by Alo Yoga, Balenciaga Japanese Denim Padded Trench ($2,990.00) and Jenni Kayne Shearling Mule ($395.00). Hailey Baldwin was spotted out and about in Brooklyn today wearing Wolford Colorado Bodysuit ($217.00), Wardrobe.NYC Leggings ($600.00 – 4 piece set), a Padded Cocoon Coat ($2,080.00) and Knife Stretch-Jersey Ankle Boots ($903.00) both by Balenciaga, Ray-Ban Classic Wayfarer 54mm Sunglasses ($153.00) and Jennifer Fisher Baby Jamma Hoops ($550.00).